Syria’s defense minister Daoud Rajiha and his deputy Assef Shawkat, President Assad’s brother-in-law, have died in a suspected suicide bombing at security headquarters in Damascus, state TV says. Daoud Rajiha and Assef Shawkat were attending a meeting of senior officials at the time. The national security chief and interior minister are said to be critically hurt. The attack comes amid claims of a major rebel offensive on the city. A statement by the armed forces read out on TV shortly after the attack said Syria was “more determined than ever” to fight terrorism and wipe out “criminal gangs”. Whoever thinks that killing top commanders “can twist Syria’s arm… is delusional”, it said. The rebels now clearly believe that victory is within sight, and the deaths will give them even greater heart. Security sources say the suspected bomber worked as a bodyguard for members of President Bashar al-Assad’s inner circle. General Daoud Rajiha has been defense minister for less than a year, serving previously as chief of staff, and is on a US blacklist for his role in the suppression of dissent. He is believed to be an Orthodox Christian – a rarity in the Alawite-dominated Syrian military and government. 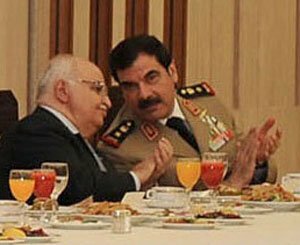 General Assef Shawkat is considered a top security chief and a member of the inner circle of the regime. He is married to Bashar al-Assad’s sister Bushra. • Turkish officials report two Syrian generals are among hundreds of refugees who fled into Turkey overnight, bringing the total number of fleeing generals to 20. • Turkish Prime Minister Recep Tayyip Erdogan is expected to discuss the Syrian crisis with Russian President Vladimir Putin. The area around the national security building, in Rawda district, has been sealed off. Witnesses at the site of the bombing said journalists were banned from approaching. “The terrorist explosion which targeted the national security building in Damascus occurred during a meeting of ministers and a number of heads of [security] agencies,” the TV said. The reports say that Hisham Ikhtiar, director the National Security Bureau, and Interior Minister Mohammad Ibrahim al-Shaar, were among those injured in the attack. Earlier, activists reported more clashes during the night in several areas around the south-west of Damascus. They said the government had brought more troops and armour into some districts, and that several people had been killed in clashes and bombardments. A rebel spokeswoman, Susan Ahmad, said the entrances to Damascus were closed on Wednesday morning. “We heard the sounds of explosions every now and then all around Damascus,” she said. “Now tanks are storming into al-Qaboun [district], shelling everything, shelling residential houses, shooting every moving thing and they are trying to arrest people and kill. Activists have also posted on the internet pictures of what they say is a barracks on the heights overlooking the city engulfed in flames. They believed it had been hit by fire from Free Syrian Army (FSA) rebels, and said the barracks is involved in providing security for the presidential palace complex below. State media said security forces fought off attacks by small groups of armed terrorists in the city. But the TV carried night-time footage of troops deployed in the Midan quarter, in some very tense and deserted streets. The rebels have declared a final battle for the capital, calling it Operation Damascus Volcano, and have been fighting troops in several parts of Damascus for the past three days. The fighting reached central areas on Tuesday, with gunfire and plumes of smoke reported in a street near parliament. The Free Syrian Army said the operation was well planned, and they had sent hundreds of fighters to the capital last week to be in place for the assault. The rebels and the government often publish contradictory accounts of the same incidents. Western journalists are under heavy restrictions in Syria, making it difficult to verify the claims of either side. The attack comes as UN chiefs have been trying to persuade China and Russia to agree tougher measures on Syria, ahead of a Security Council vote on Wednesday on imposing sanctions. UN-Arab League envoy Kofi Annan held talks with Russian President Vladimir Putin in Moscow, and UN Secretary General Ban Ki-moon met Chinese leader Hu Jintao in Beijing. The UN has until Friday to renew the mandate for observers in Syria, although a vote is expected in New York on Wednesday afternoon. Western nations want a new resolution threatening measures short of the use of force. The Western-backed draft resolution to be discussed gives the Syrian government 10 days to withdraw heavy weapons from cities and return troops to barracks, otherwise a further resolution on sanctions will be submitted to the Security Council. With Russia resisting all efforts to persuade it to take a tougher line with Syria, there is virtually no hope of concerted international action to pull the country back from the brink. About 16,000 people have died in Syria since protests against the Assad regime began in March last year.